I AM WATER Ocean Travel offers intimate wildlife encounters with the ocean’s most majestic creatures. I AM WATER Ocean Travel was started by Hanli Prinsloo, freediver and acclaimed ocean advocate & Peter Marshall, eight times backstroke world record holder. Their work is rooted in their deep love for the oceans and an avid desire to travel sustainably. On all I AM WATER Ocean Travel trips you will be hosted & coached by Hanli & Peter and you will learn the art of freediving, experience the magic of interacting with big marine animals, find inner stillness with daily yoga and eat deliciously healthy food. It’s the silence that is most startling. 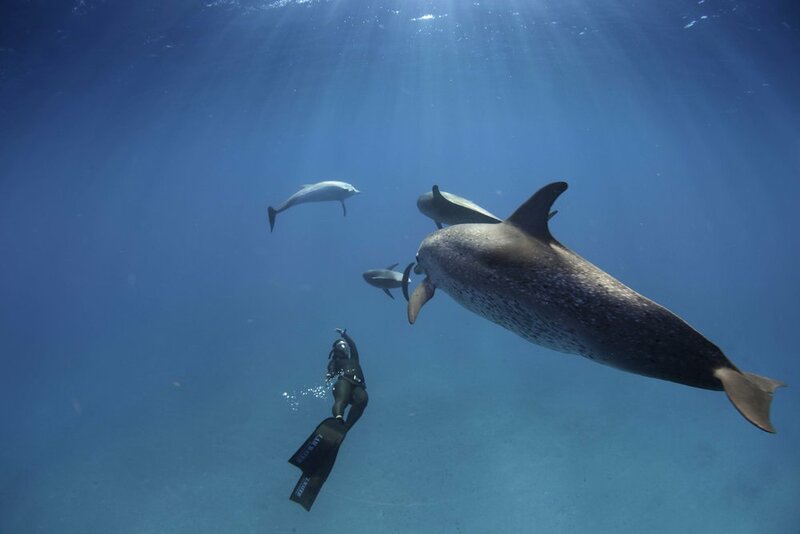 In a dark blue Indian Ocean, raked by shafts of subtropical sunlight, I’m swimming alongside a cluster of at least twenty joyfully cavorting dolphins. They dip, rise, shimmy, twist and circle around me, but not a single sound disturbs the deep peace. If the silence surprises, so does the freedom. I hadn’t expected, after just 24 hours’ instruction, to be seven metres beneath the waves, powered by a single breath and unencumbered by tanks or tubes, gliding within feet of these agile mammals. I AM WATER is at its core an ocean conservation organisation. Not only do we adhere to the highest standards of responsible marine megafauna interaction, but through I AM WATER Ocean Travel we generate funds to support the youth education workshops run by our Ocean Conservation Foundation. MARCH 2020 DATES COMING SOON! DATES FOR NOVEMBER 2019 COMING SOON! Join us on one of our all inclusive group trips to our favourite ocean destinations worldwide. Through our years of exploration, we have earmarked the best locations and seasons for animal interactions. Every year we run a select few signature trips where you join a group of maximum eight like-minded people for a week of fully curated ocean experiences and freediving training open to all levels. See all our upcoming Signature Trips with dates above. If you've always dreamt of meeting a certain marine creature, learning to freedive in a specific place, or longed for an out of the ordinary adventure, let us know and we will tailor-make something to your heart's desire. Or quite simply book one of our Signature Trips exclusively for family and friends. Our bespoke experiences can also be tailor made for corporate clients planning truly unusual off- site events or team experiences. You've already rented the perfect villa, yacht or island and you think some freediving training and guided marine exploration would be the perfect addition to your holiday? I AM WATER Ocean Travel will send you one of our top coaches to share the art of freediving on your own turf.